#TeamVirunga! We’re really excited to share the news that Virunga National Park will be taking part in the London Marathon 2017. 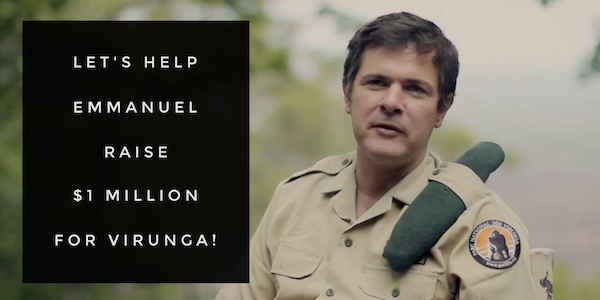 Less than three years after the park's Director, Emmanuel de Merode, was shot in an assassination attempt (just days before the world premiere of Virunga: The Movie), he is gearing up to run 26 miles through the UK’s capital with the aim of raising $1 million for Virunga. This is an ambitious aim, but it’s for an amazing cause. The park is looking to start an endowment fund that will help to secure the future of Virunga for years to come. The fund will support the widows and families of those rangers who have lost their lives in the fight to defend the park. For those in the USA, you can make a tax deductible donation via the Virunga National Park websitehttps://virunga.org/donate/. Those in UK and rest of world can make a donation via Virgin Money Giving, and if you’re a UK taxpayer, this will mean that for every £1 you donate, an extra 25p will be given to the park. Visit Virgin Money Giving or virunga.org now to make your donation. Spread the word by sharing on Twitter, Facebook, or Instagram. There’s never been a better chance for your donation to the park to go so far. Together we can reach this amazing goal!